Chocolate is almost always on my mind. My first job out of college was- as a chocolate editor for a candy magazine. Getting the recommended daily allowance of Sno-caps, Goobers, and Milk Duds were part of the job. My friends constantly asked, “Doesn’t writing about chocolate make you want to eat more of it?” Standing at a bus stop made me want to eat chocolate. So did mailing a letter, tying my shoes, and, for that matter, tap dancing. Everything made me want to indulge in my substance of choice. A STAR IS BORN: About 2,000 years ago, cocoa beans were worth their weight in mules. The Mayans used the beans as currency with a rabbit going for 10 cocoa beans and a mule putting you back 50 beans, according to the cocoatree.org Website which is sponsored by the World Cocoa Foundation and the Milwaukee Public Museum. Personally, I wouldn’t have traded in the beans. My apartment isn’t large enough to accommodate even a single mule. It's no surprise the name of the cocoa tree, Theobroma cacao, literally means "the god's food." Throughout history, chocolate has been used for medicinal purposes and as an aphrodisiac.In much more recent years, dark chocolate has been capturing the hearts of America. With its antioxidant content, dark chocolate in its purest form can potentially destroy free radicals, destructive molecules associated with heart disease, high blood pressure, and other conditions. A University of Nottingham study has even linked dark-chocolate consumption to sharpening up the mind and giving a short-term boost to cognitive skills. This was no surprise to me. I knew that back in the ‘80s when cramming for finals. But I didn’t adhere to the 1.6-ounce maximum recommended daily serving. AN OUTER BODY EXPERIENCE: I thought I had heard it all until I recently read about Debbie Light, a former pastry chef turned aesthetician, who was now dishing out chocolate facials at her new D. Light’s Spa & Salon in Danbury, Connecticut. During her 35 years as a pastry chef, Light says she baked chocolate cakes for celebrities like Danny DeVito, Willie Nelson, and Michelle Pfeiffer. If I was going to let anyone give me a chocolate facial, it was going to be Light. But I couldn’t imagine what it would be like. I quickly learned chocolate-inspired spa treatments were not edible (Light’s son, Rob, alerted me to this important detail). Light revealed chocolate had the potential to renew skin cells, flush out free radicals, and minimize large pores. Plus, the cocoa butter extracted from roasted and crushed cocoa beans made for an excellent massage cream as it smoothed dry skin. Since I already knew the comforts of cocoa, I was sold. Coming from hectic Grand Central Station via train, I was put right at ease as I entered the new, pristine 5,000-square-foot D. Light’s Spa & Salon with its soothing green and tan motif. The real treat started after my face was cleansed and gently exfoliated when a masque made with genuine Hershey’s syrup, cocoa powder, Vitamins C & E, and a touch of grape- seed oil was applied. The scent was mesmerizing, and I was in full relaxation mode for the next 20 minutes. A gentle head massage was the perfect way to pass the time. After the treatment, my face felt soft and had a peaceful glow, and the delicious chocolate aroma remained with me for the rest of the day. ON THE HOME FRONT: Back in Manhattan, I stumbled across Body Essentials Day Spa, an India-themed spa located right near Grand Central Station. I fell in love with the Chocolate Body Glide Hot Stone Massage complete with a Chocolate Paraffin Foot Scrub using home-made products with ingredients such as cocoa butter, vanilla, and chamomile. During the Hot Stone Massage, the cocoa butter allowed the heated stones to glide on my body, enhancing the moisturizing effects. As a result, my skin felt smooth from head to toe. I then discovered chocolate manicures and pedicures all around town. The cool and comfy nail lounge at Bliss’ slick 57th Street location nailed the concept of chocolate pedicures that included a luxurious chocolate-scented scrub and lotion. Also on 57th Street, Lather featured a warm vanilla foot bath, following by a Mocha Body Buff exfoliating treatment made with coffee grounds. A light Belgian Chocolate Body Whip made for a perfect finale. At Lather, each nail station had its own TV monitor, but the spa’s serene back-to-nature setting was the best show on. At Just Calm Down, I was queen for a day as I sat under a canopy in the spa’s royal-purple themed loft space where I indulged in a chocolate-inspired manicure and pedicure. My feet were soaked in a warm chocolate bath decorated with marshmallows and chocolate chips, and a chocolate-oatmeal cookie scrub served as a great exfoliator. I felt as though I had stepped back in time as I entered the old Victorian townhouse that is the headquarters of Channing’s Day Spa. Situated on Chicago’s Gold Coast, the Spa sported a bohemian décor with its beaded lamps, vintage crystal chandeliers, and leopard-print chairs. The expansive menu featured a luscious chocolate facial, which involved the traditional facial protocol, including cleansing, steam, and extraction, along with a moisturizing Chocolate Mousse Hydration Masque and a Sour Cherry Masque to help combat the damaging effects of free radicals. Both masques were from the Eminence line of paraben- and sodium lauryl sulfate-free product line. ICING ON THE CAKE: I was on a roll – call it a Tootsie Roll. I was now ready for the biggest Sugar Daddy of them all - The Chocolate Spa at The Hotel Hershey. Here I signed on for a Chocolate Fondue Wrap and Whipped Cocoa Bath. My sensory experience commenced with a cup of hot chocolate in the “Quiet Room,” following by a wonderful whipped Jacuzzi bath loaded with powdered cocoa and non-fat dry milk. It sure beat Mr. Bubbles. 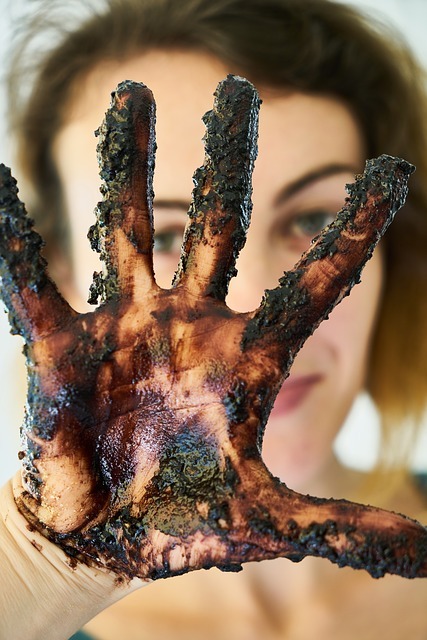 I was then escorted to my Chocolate Fondue Body Wrap where I was covered in detoxifying Moor Mud mixed with hints of chocolate and, subsequently, wrapped in a soft warm blanket to enhance the mud’s nourishing effects. The last phases of the treatment called for a warm Vichy Shower, followed by an all-over application of cocoa oil. I was completely relaxed and was ready for chocolate martinis at The Hotel Hershey’s Iberian Lounge. As a souvenir of my trip to Hershey, I picked up a few purse-size bottles of cocoa body oil. Napoleon is said to have carried chocolate on his journeys to renew energy. I now apply cocoa oil when confronted with life’s battles. CRAZY FOR COCOA: I found most chocolate-inspired services to offer the same benefits as their non-chocolate counterparts, but the addition of cocoa left my skin feeling especially soft and nourished all over. The chocolate facial left my pores felt tighter and cleaner. I also found the chocolate aroma in all of these services to be extremely relaxing and soothing – an especially ideal choice on cold winter days. It also brought back fond memories of sharing chocolate Mister Softee cones and bags of Hershey’s Kisses with my childhood friends. Moving forward, I plan to start thinking outside the chocolate box and picking up gift certificates for chocolate-inspired spa treatments for Valentine’s Day, Mother’s Day, and other celebratory occasions. These novelty treatments are great alternatives to more mainstream offerings - but there’s one requirement. You must adore chocolate. 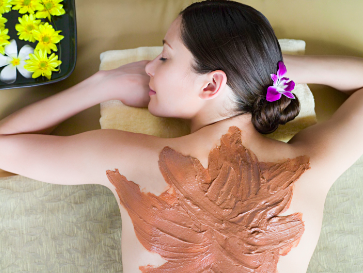 Since an increasing number of spas nationwide are whipping up chocolate-inspired treatments, you may want to inquire about whether your favorite local spa offers such services. There are also myriad chocolate-inspired products on the market. Since my chocolate expedition, my bathroom shelves and cabinets have been transformed into a chocolate factory sans Charlie. I’ve discovered chocolate shampoos, bath oils, perfumes, scrubs, body lotions, nail polish, lipsticks, and eyeshadows. I’ve even tracked down chocolate tattoos and voodoo dolls. Last night, I treated myself to a frosted chocolate milk bath. My dream had finally become a reality. I was up to my ears in chocolate.